← Organized tour or random wanderings? 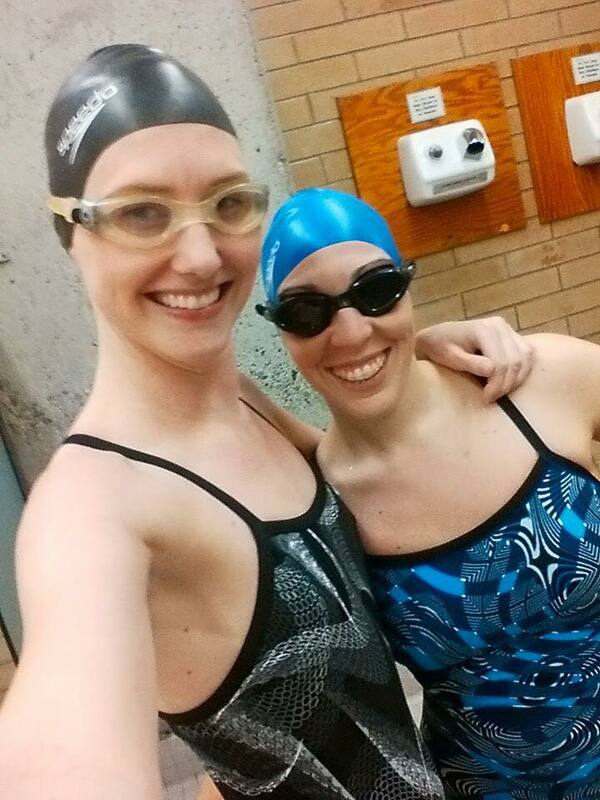 As I mentioned a few months back as I described life in Vancouver, I was training for my first-ever triathlon. To be clear, I was not training for an Ironman, or even a normal Olympic length triathlon. No, no, I was training for a sprint triathlon, and a bit of a mini one at that. Those of you who know me well will know that I tend to get a bit obsessed with things. If I like something, if I think I have a chance to succeed, I will go all the way. I don’t do halves. I liked singing, so I took over running my choir when the executive quite. I liked travelling, so I quit my job and travelled. I liked diving, so I turned it into a full-time job. I liked training, so I did it 20 hours a week, every week, for three months in preparation for my one hour and 15 minutes of glory. But let me back up a bit to the beginning of this journey . 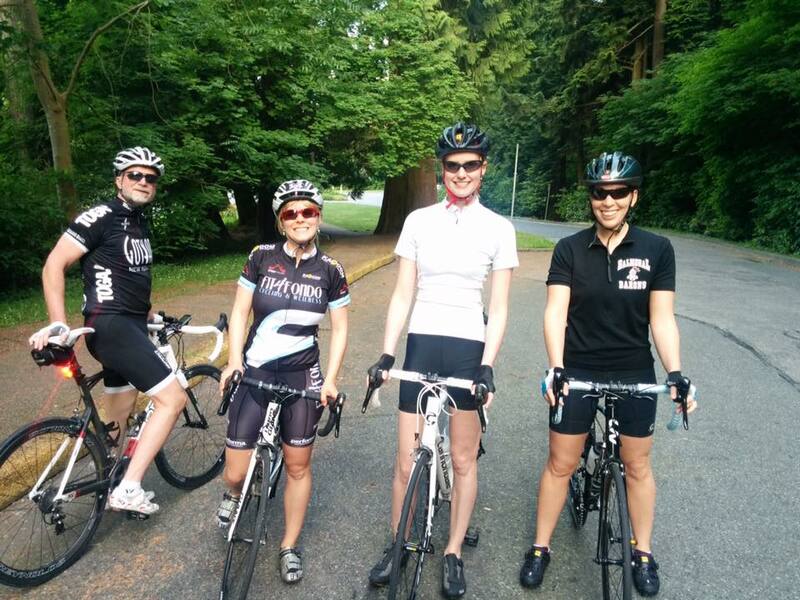 . . At the beginning of the year, an email came around at work asking who wanted to be a part of the Fitness and Adventure Club at Doctors of BC. Wanting to finish a Sun Run in an hour, I signed up, and arrived at the bike racks at P1 on the appointed day and time. Weekly I was introduced to some new faces from around the organization. The Sprint Kid from Negotiations, the Bike Fanatic from Systems, the Running Chicks from PSP, and my future Tri-Wife from Shared Care. As the weeks rolled by, it became very clear that only one of the Running Chicks and I were actually interested in keeping up the running . . . we moved our runs to lunch time and solved the problems of the world on a weekly basis, from 1665 West Broadway to either Kits Pool or Cambie Bridge, and back. 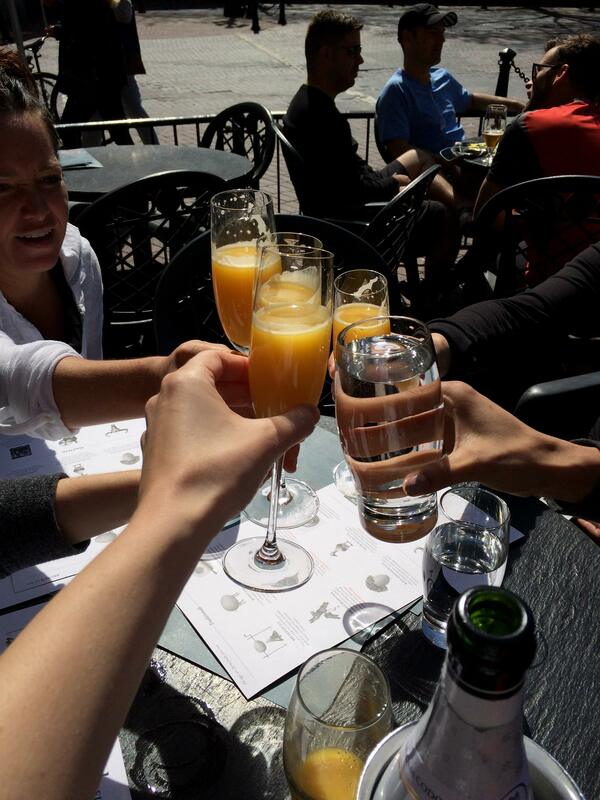 The Sun Run came and went, goals were met, champagne was popped and it was time to get serious about doing more than one sport. 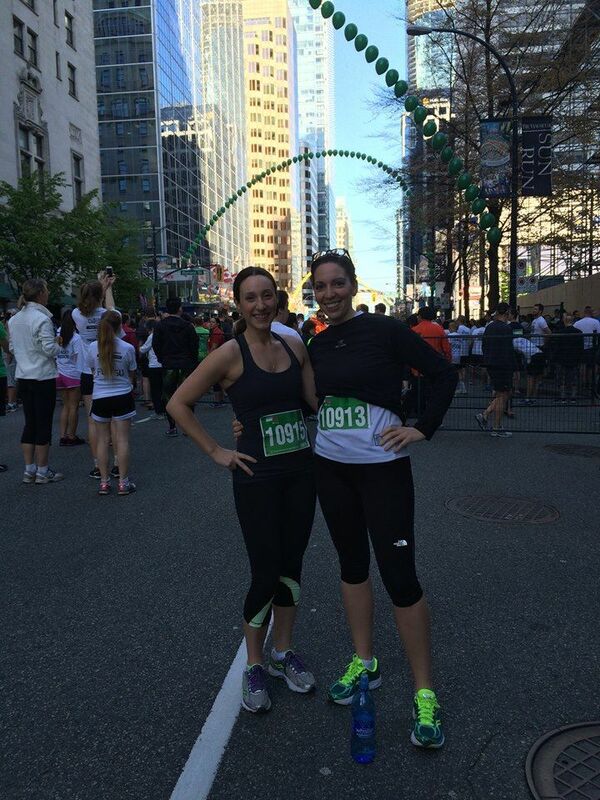 My awesome runny buddy and I before the start of the Sun Run. Rewind 6 weeks to mid-March, and a Happy Hour meeting at Earls. 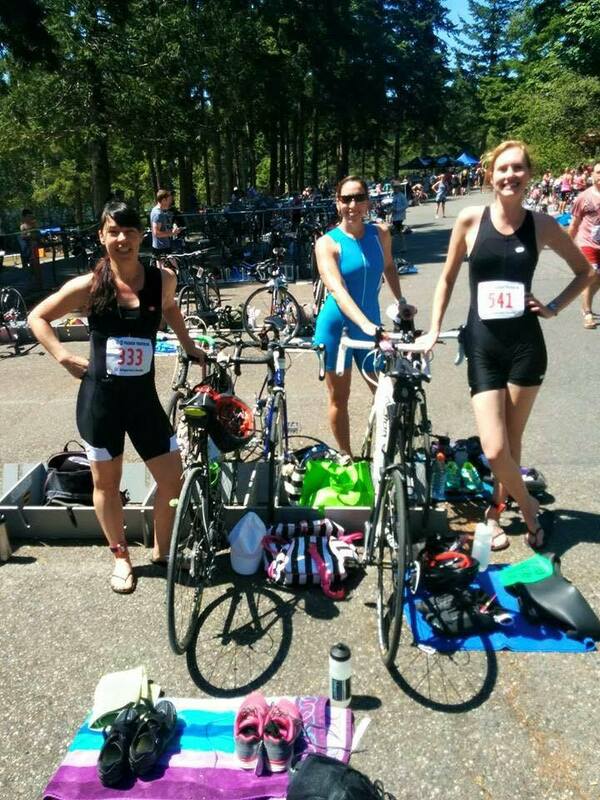 I can’t tell you the details, as the Cone of Silence was invoked, but suffice it to say that three wine-fueled ladies had all signed up to friendlily compete in a sprint triathlon, the first for two of us. As March rolled into April, and April into May, the training ramped up. Swimsuits were bought and we had our nicknames: Swoosh and Swirl. Speed swooshes and speed swirls. They make us go faster. No really, we needed (and still need!) all the help we can get. Us tri-newbies bought new bikes (Periwinkle and Rocket James), new pedals, new shoes, new shorts, new shirts . . . MEC became a seriously dangerous place as hundreds upon hundreds of dollars disappeared down the Tri Hole. All for a sprint. 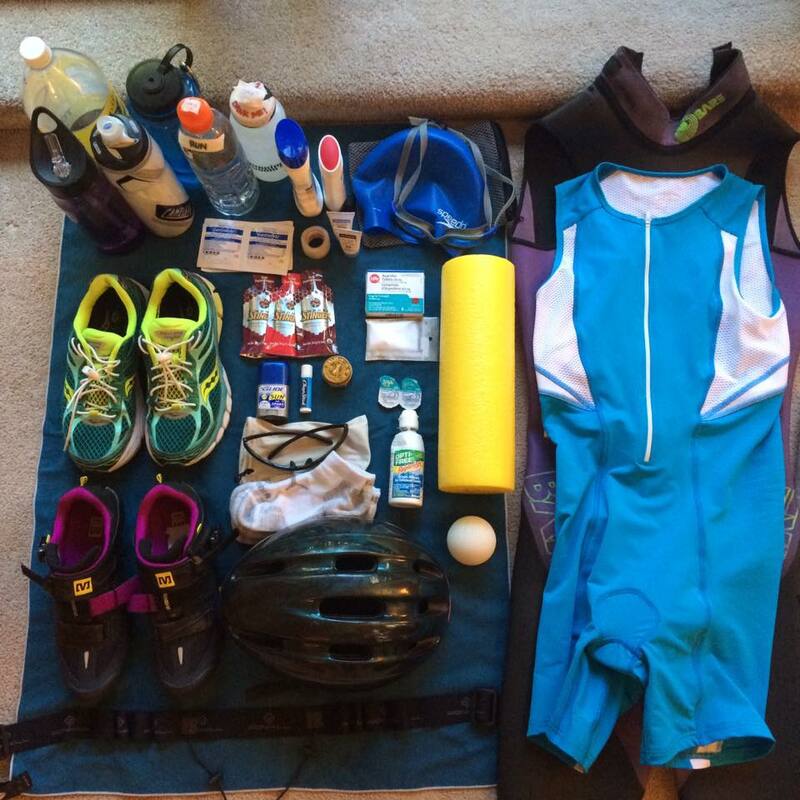 All for 1/4 mile of swimming, 10 miles of biking and 2.6 miles of running. Averaging 20 hours a week of training, it slowly started coming together. Six am became a standard wake up call. A double lap of Stanley Park before work became the norm. Eating 2300 calories a day. Instead of just finishing the race, our goal shifted to timing. We knew we could do it, barring any external forces, now it became a matter of how fast. Race day arrived. It was that heat wave at the end of June . . . the 30+ degree days? It was then. It was awesome. Pre-race at Padden, all ready to go. 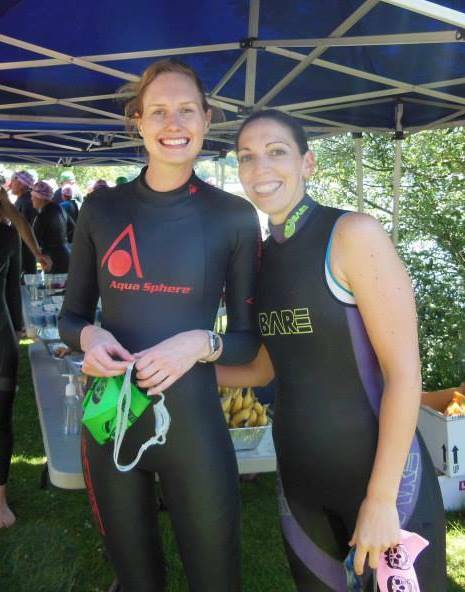 Pre-race at Padden, ready to swim! 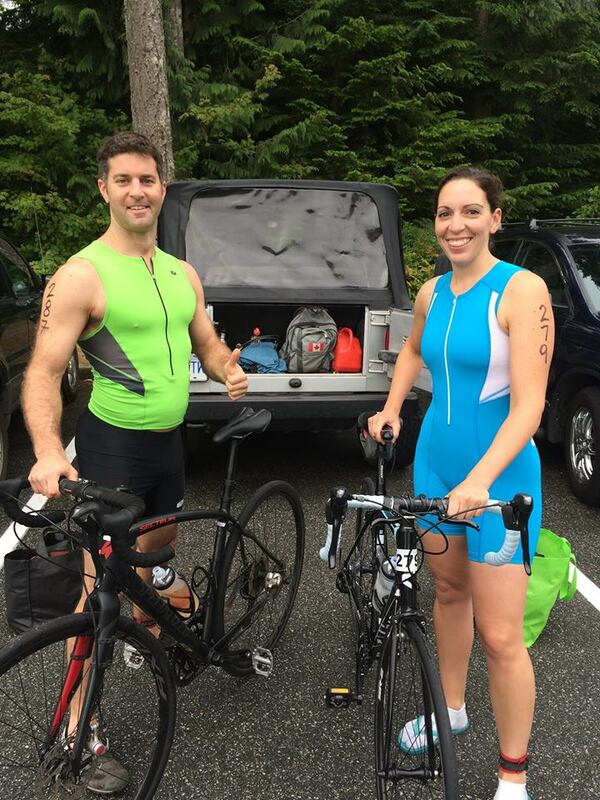 Two weeks later I did my second, full distance sprint triathlon in Squamish with my cousin. It was overcast, threatening rain, and less than 20 degrees. It was still awesome. 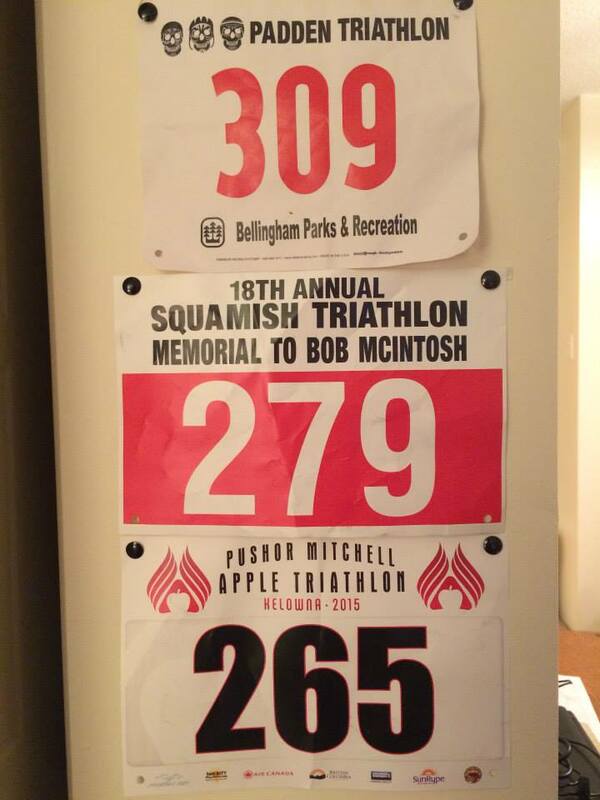 This past weekend, Swoosh and I and the Tiny Dinos headed up to Kelowna to compete in the Apple Triathlon. Started the year before we were born, the weekend has become a huge event with multiple races over two days. Our sights were set on the sprint Sunday morning. Saturday was a perfect day; sunny, clear, not a cloud in the sky. We picked up our race packages, toured the bike course, racked our bikes in transition, attended the briefing, and tried to get ALL of our gear stolen by leaving the car door open. Thank goodness for the good people of Kelowna, every single thing was still there after two hours of our stupidity. Lakeside dinner and drinks at the El Dorado and a 9:30pm bedtime . . . 4:30am comes early on race day. By 5:30 we were at the compound. The sun never rose on Sunday in Kelowna, as the smoke from the Washington State forest fires increased the air quality to an incredible 20. A final check on the bikes, pumping tires, laying out our transition towels, checking and rechecking to make sure everything is just where it needs to be. The call to marshal in the starting area, the call to line up on the beach, the airhorn to GO! More practiced this time, we swam, biked and ran with our heads held high. Triathlons are FUN!!! The volunteers who line the course are so encouraging, the other competitors are kind and courteous even when passing you. Cheering on others to make it up the hill is always encouraged and appreciated. After an admirable 1:35, we crossed the finish line. Nine am and we were done. We immediately lined up to get our free massages, and ate cheeseburgers before 10am. We wandered around, eating, rehydrating, changing (it was cold! 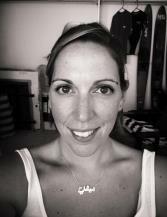 ), packing, talking to new friends and cheering on the other athletes. Finally around noon we called it a day, picked up our trusty steeds and went to take a nap. Seven and a half hours later, if you were anywhere along Grandview Highway from Boundary to Pine, you might have seen us; you definitely would have heard us. Half-crazed from exhaustion, lack of sleep, exertion and a maddening drive in from Hope, our legs resisting every time we tried to get out of the car, we had found a radio station playing hits from the 90s. Ace of Base, Marcy’s Playground, Michael Jackson all pumping from the speakers as we sang at the top of our lungs and car-danced the final few clicks home. My first tri season is done now, I leave tonight for three weeks in Vietnam where I don’t have to swim, bike or run for any other reason than I want to. Luckily, I do want to. I’m already planning next year’s season, thinking about which races to do, which distances. I’ve already signed up for another 10K in October. For now, though, it’s rest time. Time to eat normal amounts of food, see friends, have a life; my tri-riffic summer might be at an end, but it feels like my tri-riffic life is just beginning. Check out my photo album here! Want to see more pictures of my training journey? Make sure to follow me on Instagram @travelling_twin! This entry was posted in Canada, Exercise, Family, Food, Friends and tagged Apple Triathlon, Bellingham, bike, family, food, friends, Kelowna, Kelowna Triathlon, Lake Padden Triathlon, MEC, Mountain Equipment Co-op, Pushor Mitchell Apple Triathlon, run, running, sprint tri, sprint triathlon, Squamish, Squamish Triathlon, Sun Run, swim, T1, T2, training, transition, tri, tri training, triathlon, triathlon training, Vancouver, Vancouver Sun Run. Bookmark the permalink.